An exotic island. The world’s top wedding planners. A murderer out for revenge. Wedding planner Annabelle Archer feels like she’s finally hit the big time when she and her team are invited to go to Bali along with some of the world’s most illustrious wedding planners. The dream quickly turns into a nightmare when a fellow planner is poisoned at the welcome dinner. When another murder follows quickly on the first, it’s clear that the killer is out for revenge. Can Annabelle and her colorful crew discover who’s poisoning the planners before the killer serves up another dose of death? Eat, Prey, Love is the seventh book in the Annabelle Archer cozy mystery series. If you like charming characters, fast-paced comedy, and behind-the-scenes glimpses into the wild world of weddings, then you’ll love Laura Durham’s Agatha award-winning mystery. 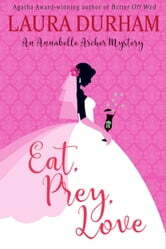 Get Eat, Prey, Love to discover the award-winning mystery series today! The Annabelle Archer books are fast-paced cozy mysteries featuring a female protagonist with a little romance and comedy thrown in. You'll find the series focuses on the murder mysteries with a jewelry heist caper and ghost story in the mix to keep things interesting. Plus, Richard acquired a Yorkie in Review To A Kill, so the latest books are also for fans of animal or dog mysteries. And since Richard is a caterer and he loves food, in a way these books are also culinary mysteries! Q – In what order should I read the books? A - Because the Annabelle Archer cozy mystery series is fun, light, and the perfect escape or beach reading. Better Off Wed has hit number one in the Kindle store and won the Agatha Award for the Best First Novel. "A delightfully witty blend of murder and matrimony"- Donna Andrews, author of "How the Finch Stole Christmas"
Annabelle Archer is off to Bali for a working vacation with her crew, what could possibly go wrong on a beautiful island surrounded by other event planners. Just when you think you know who the villain is turns out it's not them. Great descriptions of the locations and food as well as hilarious hijinks. If you think visualizing someone runing through the jungle screaming with a monkey on top their head is funny (and it is) this book is for you. I received a free copy of this book via Booksprout and am voluntarily leaving a review. This story takes place in Bali. Watch out Bali ..here comes Annabelle her crew!!! It seems Annabelle doesn't even need a Wedding to find herself right in the middle of, as always...Murder! At the Luxurious hotel they are staying at for the FAM event she feels as though she's finally in the big leagues. Then that old adage "Don't Drink the (Water)" errr.....make that to alcohol, or you may die is all too real. Annabelle just can't stay out of it. This means Richard, Kate, Fern and she are once again in a crazy mess and people are dropping. Literally! Another fun fast paced mystery with Annabelle and her crew. A real page turner. Kept me guessing til the end. Witty dialogue. Well written likeable characters. I have read all the books in this wedding planner series and can't wait for the next book to come out!!! I received a free copy of this book via Booksprout and am voluntarily leaving a review. I loved this new chapter in the Annabelle Archer series!!! Set on the tropical island of Bali, Annabelle and her team must uncover a murderer before they become the next victim. Funny and suspenseful at the same time! Truly a great read! Fantastic read that takes you on a vacation! Annabelle is off to a foreign land and ends up solving more crime! Excellent characters in a romantic setting! Durham has just the right components, once again, to pull you in so you feel like you are right there in the thick of things! Characters are believable, plot sounds plausible and just the right amount of suspense to make you want more! More books that is! A great read! I received a free copy of this book via Booksprout and am voluntarily leaving a review.